Lynne Carr: Having a Maths day. I looked at the jumbled heap of toys, clothes, food and a large blue sleeping bag on the living room floor and realised that this activity had actually worked. 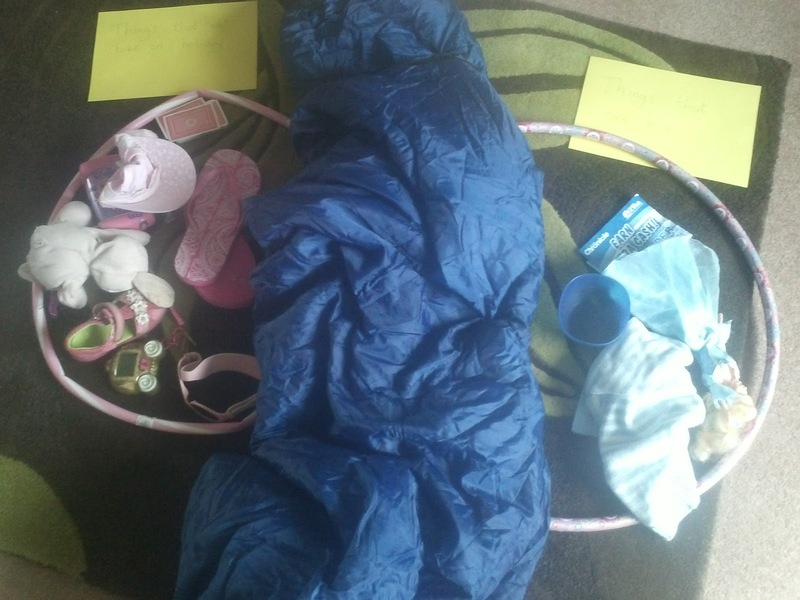 My two children had understood the concept of a Venn diagram, and found objects that fitted into two hula hoops labelled "things that are blue" and "things we could take on holiday", with the space where the hula hoops intersected overflowing with the blue sleeping bag. We were having a "Maths day". Is this a bit geeky, or is cool? I like to think it's the latter, but then I do love Maths. It was the first in a series of "challenges" that I set them, with little prizes as they completed each one - chocolate coins, sparkly pencils and stickers. My four year old loved the idea of taking 5 big steps and 10 jumps then climbing up 12 steps to find the treasure, while the 7 year old found circles and cylinders in the kitchen. They both made me cuboids out of lego, after first sharing the pile of lego pieces equally between the three of them. (Yes, I know I've only got 2 children - we were playing with Flower, the 4 year old's imaginary friend that day). Here's another idea - if you want 5 minutes peace (exactly 5 minutes that is), set a stopwatch for 5 minutes and sit your kids next to a window overlooking a road. Get them to fill in a tally chart that records the colours of the different cars that drive past. If they're up for it they can then make this into a bar chart. They might need your help for this bit, depending on their ages - this is why it's only 5 minutes of peace. Mine actually co-operated on this one, and worked together to spot and record the numbers of cars driving past. I have no idea how accurate their recording was, but did that really matter? Probably not. You can adapt these to older kids too. Draw Venn diagrams on a piece of paper and write in the objects, or names, if hula hoops and toys are too babyish. Make it more difficult by adding another circle and labelling them with things that interest them: Names of x-factor, big brother and BGT contestants, or whatever they're into. They could do a survey among friends and family of favourite types of TV programmes, or music, or hair colour, or time spent on the internet every day! Then ask them to present the results in an appropriate type of chart. Play "I spy a shape" with more points for more unusual shapes. E.g. 1 point for a circle or square, 3 points for an oval, 5 points for a hexagon or pentagon. I think Maths is fun and my kids love these kind of challenges. My only problem is the time it takes to tidy up after a Maths day - now where did they get that blue sleeping bag from?